Wild Toro is a 5 reeled, 178 paylined new game by Elk Studios. The game has just been released and it is already proving to be a great hit at all casinos that offer the game. This does not come as a surprise to anyone. This is because Elk Studios is well known for its unique and exquisite games. The new title has a Mexican theme as it takes players on a ride with The Matador who is going against Wild Toro, who is the main character in this game. Wild Toro, the newest Elk Studios game is out, and it is taking the world of online gaming by storm. This is because of its exciting theme, visuals and of course, its generous payouts. The game has a Mexican theme as it invites players to witness a battle between the game’s two main characters. These two characters are the Matador who is Diaz Jr. and the Wild Toro. Players will witness these two characters clash in a Spanish setting as the get to claim their share of the Spanish fortunes and prizes. They will do that as they form winning combos on the 178 lines of the game. They will also get to take advantage of the special icons and features that the slot has to offer. The game play is quite simple, like any other Elk Studios slot. Players can easily place their wanted wagers on the left side of the reels. It is where they will find the Coins button that allows them to determine their wager. The available bets vary between 0.20 and 100. Players will then spin the reels by clicking on the spin button on the right, which also has an Auto Play function. The game depicts the theme of the game perfectly through its visuals and symbols. This is why the 5 reeled setup of the game is located in a Spanish town, with Spanish rooftops and streets in the background. As for the symbols that will spin on the reels. 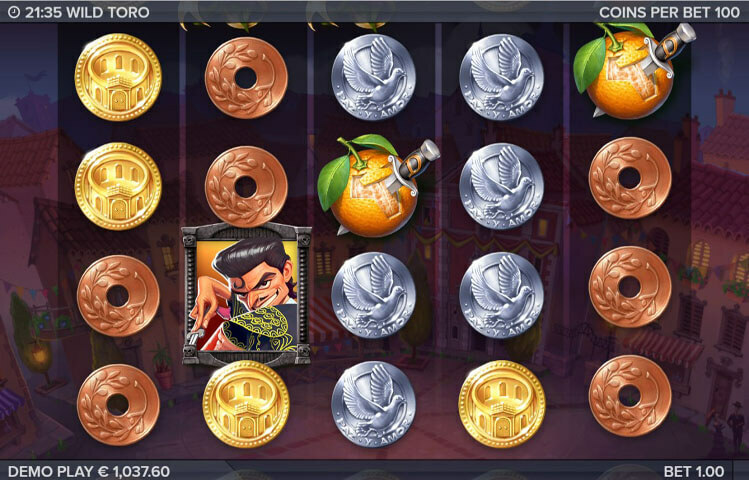 They include Toro, The Matador, Spanish golden coins, Spanish silver coins, the logo of the game, flowers, oranges and more. These icons would turn into well crafted animations whenever they are a part of a winning combo. The logo of the game represents the wild symbol of the game. This wild can land on the game’s reels to substitute for all icons, except Toro and the Matador icons. It will replace the symbol that is going to result in the biggest prize for the players. Toro is the Walking Wild, which means that it will substitute for other icons while moving from the left to the right. Last but not least, there is the Matador icon, which can trigger the Matador Re Spin challenge when 3 of them land on the reels.